It's a prime example of the new globalism. 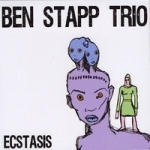 California-born tubist Ben Stapp graduated from UCLA, studied with English tuba master Roger Bobo overseas, then spent additional time studying in Portugal before returning home to record his debut album, Ecstasis. Demonstrating nimble dexterity and a keen melodic sense, the youthful Stapp holds his own in the heavyweight company of saxophonist Tony Malaby and percussionist Satoshi Takeishi. Tuba driven small combos were a favored line-up of saxophonists Arthur Blythe and Sam Rivers during the seventies loft era; the tuba helped reestablish a historical connection between free jazz and the rich polyphony of early jazz styles such as Dixieland and ragtime. Stapp mostly avoids such pre-swing forms however, tending towards a slightly modal pan Asian aesthetic. Malaby's serpentine soprano and muscular tenor musings, Takeishi's scintillating Taiko influenced percussion and the leader's euphonious bass lines congeal into an exotic mosaic of plangent themes and soaring motifs. Modal structures notwithstanding, Stapp also works conventional chord changes, thorny counterpoint, and elastic rhythms into his tunefully accessible, yet harmonically intricate writing. The trio vacillates between the written and improvised with poised authority and an empathetic rapport that blurs the line between freedom and form. Stapp's melodious variations complement Takeishi's ceremonial fanfares and kaleidoscopic accents, providing the trio with a harmonically solid, yet rhythmically fluid foundation that veers from buoyant to introspective. Malaby reigns in his extroverted tendencies, splitting his time evenly between soprano and tenor, while embellishing Stapp's memorable themes with lyrical restraint. Despite the limited instrumental palette, Stapp utilizes an array of inventive arrangements to provide the trio with ample space for individual expression. Unaccompanied cadenzas, intimate duets and collective improvisation are all featured alongside more conventional devices, like hypnotic bass ostinatos and concise call and response, keeping the structures malleable and joyously unpredictable. A credit to both the trio's conversational interplay and Stapp's resilient writing, the session flows with the graceful logic of a suite rather than a collection of disparate tunes. Ecstasis marks the solid debut of a fresh, new voice. Track Listing: Painted Sharks; Machu Picchu; Don't Bop Your Head; Dying Bumble Bees; Once in Evora; Negative Space; Power Drop; Sick Attachment; Forgotten Scream. Personnel: Benjamin Stapp: tuba; Tony Malaby: tenor and soprano saxophones; Satoshi Takeishi: percussion.